Owning a smartphone as grandiose as the Samsung Galaxy Note II doesn't necessarily cost an arm and a leg. As long as you are okay with Sprint being your wireless carrier, the handset can be yours for a very reasonable $100, which is $200 less than what the device costs at a Sprint store. This tempting deal is available to new subscribers via Amazon Wireless, where both the smartphone's white and titanium variants are on sale with a new 2-year contract. Note, however, that the Verizon and AT&T Samsung Galaxy Note II models aren't as cheap. The online retailer is selling them for $200 and $240 respectively on a 2-year service agreement. 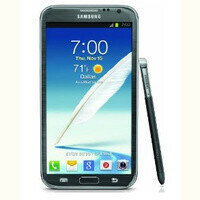 Since the Samsung Galaxy Note II has gained a lot of followers since its introduction, it won't be surprising if the deal doesn't last long. Perhaps it would be wise to act swiftly in case you really want one. If in doubt whether this is the right smartphone for you, you can check out our Samsung Galaxy Note II review. Good deal if you are a new customer. I think the price to add it to a line was $169. Jeradiah3. Actually Sprint is prohibited by law to control pricing used by our third party distribution stores. That is so tempting, but I really want to wait and see if 1.) The sony xperia Z lands on Sprint. 2.) The Samsung Galaxy S IV is a better choice. 3.) I'm also curious to see if any nokia windows phone will land on sprint in the future. 4.) Blackberry 10 will make my selection even more difficult. but that's such a great deal being the best smartphone on Sprint currently.